This is our kindest holiday in one of the quietest areas of the Lake District National Park. 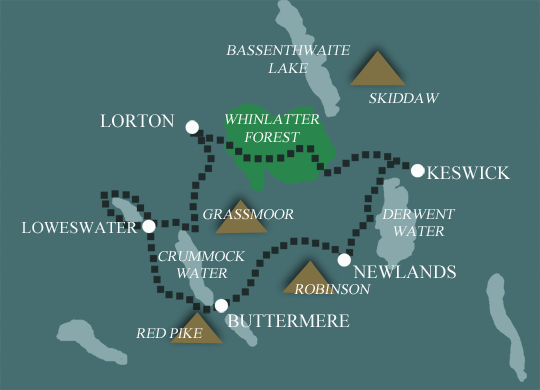 It is based around the peaceful lakes of Loweswater, Crummock and Buttermere in the North West corner of the Lake District, and uses well defined paths, forestry tracks and country lanes. The distances covered each day are relatively short with the exception of one mountain pass involving an easy climb of 200metres. The route generally keeps to relatively flat valley bottoms and there is plenty of time to take it easy, enjoy some spectacular scenery and soak up the tranquility. We offer two holidays in the Vale of Lorton. One is for 4 nights and the other is 6 nights. Make your choice depending on your available time and the pace you find most comfortable. We offer 2 holidays covering the whole route - the longer the holiday, the shorter you have to walk each day. Peaceful walking in the quieter areas of the Lake District National Park. Varied walking along forest trails, lake shores and remote valleys. Starts and finishes in the bustling market town of Keswick. Prompt and thorough responses, communication and guidance in regards to Storm Callum and the beautiful bespoke Vale of Lorton walk developed by Mickledore – Thank you for a fabulous walking holiday (our second with Mickledore). This is my 5th Mickledore walk. I’ve recommended it to friends – never been disappointed. Great track record. Keep up the good work.